Cosmin Moti has won five caps for Romania - as a defender. Defender Cosmin Moti saved two shootout penalties to send Bulgarian side Ludogorets into the group stage of the Champions League for the first time. The centre-half, 29, went in goal after keeper Vladislav Stoyanov was sent off in the final minute of extra time. In an an incredible finale to the tie with Romanian champions Steaua Bucharest, Moti scored the first spot-kick and then saved two penalties. The group stage draw takes place on Thursday at 16:45 BST. 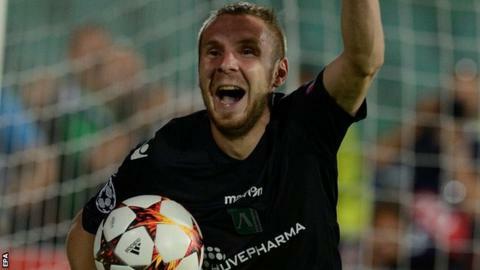 Ludogorets's Champions League dream had looked over going into the final stages. Ludogorets were only formed in their current guise in 2001. Trailing 1-0 to Steaua from the first leg, the Bulgarian champions forced extra-time when substitute Wanderson volleyed home a wonderful last-minute equaliser from 20 yards. Stoyanov was then dismissed in the final minute of extra-time for hacking down Fernando Varela, and, with no substitutions left, Moti volunteered to go in goal for the shootout. Wearing the black shirt of substitute keeper Ivan Cvorovic, Moti confidently smashed home the opening kick to put his side ahead. He then dived to his right to deny Paul Pirvulescu before stopping Cornel Rapa's tame effort. Moti, a Romanian international who spent seven years with Steaua's city rivals Dinamo Bucharest, leapt over the advertising boards to celebrate with the home fans. Match ends, Ludogorets Razgrad 1(6), Steaua Bucharest 0(5). Penalty Shootout ends, Ludogorets Razgrad 1(6), Steaua Bucharest 0(5). Penalty saved! Cornel Rapa (Steaua Bucharest) fails to capitalise on this great opportunity, right footed shot saved in the bottom left corner. Goal! Ludogorets Razgrad 1(6), Steaua Bucharest 0(5). Fábio Espinho (Ludogorets Razgrad) converts the penalty with a right footed shot to the bottom right corner. Goal! Ludogorets Razgrad 1(5), Steaua Bucharest 0(5). Andrei Prepelita (Steaua Bucharest) converts the penalty with a right footed shot to the bottom left corner. Goal! Ludogorets Razgrad 1(5), Steaua Bucharest 0(4). Svetoslav Dyakov (Ludogorets Razgrad) converts the penalty with a right footed shot to the bottom left corner. Goal! Ludogorets Razgrad 1(4), Steaua Bucharest 0(4). Fernando Varela (Steaua Bucharest) converts the penalty with a right footed shot to the bottom left corner. Goal! Ludogorets Razgrad 1(4), Steaua Bucharest 0(3). Marcelinho (Ludogorets Razgrad) converts the penalty with a right footed shot to the centre of the goal. Goal! Ludogorets Razgrad 1(3), Steaua Bucharest 0(3). Adrian Popa (Steaua Bucharest) converts the penalty with a right footed shot to the bottom left corner. Goal! Ludogorets Razgrad 1(3), Steaua Bucharest 0(2). Junior Caiçara (Ludogorets Razgrad) converts the penalty with a right footed shot to the top left corner. Goal! Ludogorets Razgrad 1(2), Steaua Bucharest 0(2). Lukasz Szukala (Steaua Bucharest) converts the penalty with a right footed shot to the bottom right corner. Goal! Ludogorets Razgrad 1(2), Steaua Bucharest 0(1). Hamza Younes (Ludogorets Razgrad) converts the penalty with a right footed shot to the top left corner. Penalty saved! Paul Parvulescu (Steaua Bucharest) fails to capitalise on this great opportunity, left footed shot saved in the bottom left corner. Penalty saved! Wanderson (Ludogorets Razgrad) fails to capitalise on this great opportunity, right footed shot saved in the bottom left corner. Goal! Ludogorets Razgrad 1(1), Steaua Bucharest 0(1). Claudiu Keseru (Steaua Bucharest) converts the penalty with a left footed shot to the bottom right corner. Goal! Ludogorets Razgrad 1(1), Steaua Bucharest 0. Cosmin Moti (Ludogorets Razgrad) converts the penalty with a right footed shot to the bottom right corner. Penalty Shootout begins Ludogorets Razgrad 1, Steaua Bucharest 0. Second Half Extra Time ends, Ludogorets Razgrad 1, Steaua Bucharest 0. Corner, Steaua Bucharest. Conceded by Georgi Terziev. Attempt blocked. Nicolae Claudiu Stanciu (Steaua Bucharest) right footed shot from outside the box is blocked. Vladislav Stoyanov (Ludogorets Razgrad) is shown the red card. Foul by Vladislav Stoyanov (Ludogorets Razgrad). Fernando Varela (Steaua Bucharest) wins a free kick in the attacking half. Svetoslav Dyakov (Ludogorets Razgrad) wins a free kick on the left wing. Foul by Nicandro Breeveld (Steaua Bucharest). Attempt missed. Nicandro Breeveld (Steaua Bucharest) left footed shot from outside the box is high and wide to the right. Assisted by Adrian Popa. Attempt missed. Claudiu Keseru (Steaua Bucharest) right footed shot from the left side of the box misses to the left. Assisted by Nicolae Claudiu Stanciu. Hand ball by Svetoslav Dyakov (Ludogorets Razgrad). Svetoslav Dyakov (Ludogorets Razgrad) wins a free kick in the defensive half. Foul by Claudiu Keseru (Steaua Bucharest). Foul by Adrian Popa (Steaua Bucharest). Dani Abalo (Ludogorets Razgrad) wins a free kick on the right wing. Foul by Lucian Filip (Steaua Bucharest). Second Half Extra Time begins Ludogorets Razgrad 1, Steaua Bucharest 0. First Half Extra Time ends, Ludogorets Razgrad 1, Steaua Bucharest 0. Andrei Prepelita (Steaua Bucharest) wins a free kick in the defensive half. Foul by Yordan Minev (Ludogorets Razgrad). Cornel Rapa (Steaua Bucharest) wins a free kick in the defensive half.